Every year I struggle with getting students to bring in their reading logs. I have tried giving out extra rolls for Homeworkopoly, but even that doesn't work! My Reading Safari ribbons were inspired by a photo posted by Jaime over at What's the Buzz in First. While her "poster holders" are intended for Common Core Standards, mine will hold small safari-themed cards that students will earn for bringing back their logs. Although there are no cards on the ribbons yet, I created them with clip art purchased from ThistleGirl Designs. As a thank you for reading all the way to the bottom, here is a freebie for you. 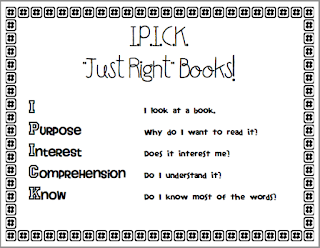 It's an I PICK poster for The Daily Five. As always, click on the picture to grab my file and please post a comment if you use it in your classroom! Thanks for the shout out!! Your monkeys are adorable!